This is a very rare recording of an all-female group of Bhutanese chanters. According to legend, this CHOD Ceremony was created centuries ago by the yogini, Machig Labdron, a reincarnation of Yeshe Tsogyal. To our knowledge, this is the first time an all-female group has offered the CHOD in hundreds of years. The sounds of the CHOD are direct and visceral as its purpose is to generate primordial awareness through cultivation of fearless equanimity. 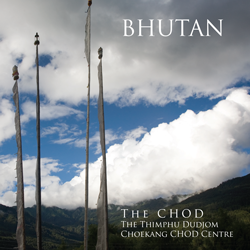 All profits from the sale of this recording are sent back to the CHOD Center in Bhutan. This is a project of the Sound Healing Foundation, a 501c3 Non-profit Foundation.